The best part about Christmas is being reunited with family both near and far. 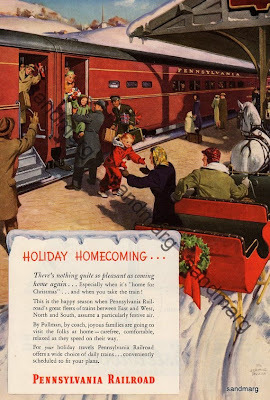 This charming Pennsylvania Railroad ad shows the train at the station as family members joyfully greet each other. A handsome horse and red sleigh await to transport happy family members home. This beautifully nostalgic print is a work by the famous illustrator Jerome Rozen (1895-1987) whose work appeared in Country Home, Good Housekeeping, Liberty, Pictorial Review, Redbook, and The Saturday Evening Post but was most famous for his work as a pulp artist. This is a beauty. I posted a train picture today too. Must be something about the time of year. I wish I were going on a train trip sometime soon.